Globe Electric's 32 inch Multi-Joint Desk Lamp with Metal Clamp is an ideal option for desk lighting. The spring loaded swing arm is easily adjustable to direct light wherever you need it the most while the metal clamp is perfect to mount on study tables, workstations or office desks. The 6 ft. cord allows you the ability to place the light anywhere you want regardless of where your wall socket is located. The on/off switch is conveniently located on the base of the lamp for quick and easy use. Requires one 60W max E26 Edison bulb (sold separately). Sleek Designed multifunctional desk lamp lets you do outstanding precision work under optimal lighting conditions. Designed to provide 20,000 hours of light, the lamp uses safe, energy-efficient LEDs. The bonus? There's a built-in USB port, so you can charge gadgets from the lamp's base with ease. A beautiful addition to your desk, nightstand or end table, Globe Electric's Hartford Desk Lamp brings a modern elegance to every space. The round base features sturdy construction and angled sides for a chic cohesive look. The matte brass finish pairs perfectly with a stunning arched arm to evoke a stylish but dignified feel amongst its onlookers. Finished with a matte white shade, the Hartford Table Lamp provides a sensational soft white glow to any area. A black fabric cord rounds out the brilliant design ensuring the timelessness of this piece. Requires one E26/medium base 40-watt bulb (sold separately). The Hampton Bay 13-7/8-inch Satin Chrome Clamp Lamp is perfect for providing accent lighting for reading, computer work, laundry chores or wherever your imagination leads you. With lines designed to fit any decor and a sleek satin chrome finish, this adjustable lamp easily clamps to a bed, a desktop and a wide variety of furnishings. Easy to operate with a convenient on/off switch, this lamp is versatile and functional and will provide bright and ample illumination. 32-inch Multi-Joint Black Metal Clamp Desk Lamp Globe Electric's 32 inch Multi-Joint Desk Lamp with Metal Clamp is an ideal option for desk lighting. The spring loaded swing arm is easily adjustable to direct light wherever you need it the most while the metal clamp is perfect to mount on study tables, workstations or office desks. The 6 ft. cord allows you the ability to place the light anywhere you want regardless of where your wall socket is located. The on/off switch is conveniently located on the base of the lamp for quick and easy use. Requires one 60W max E26 Edison bulb (sold separately). 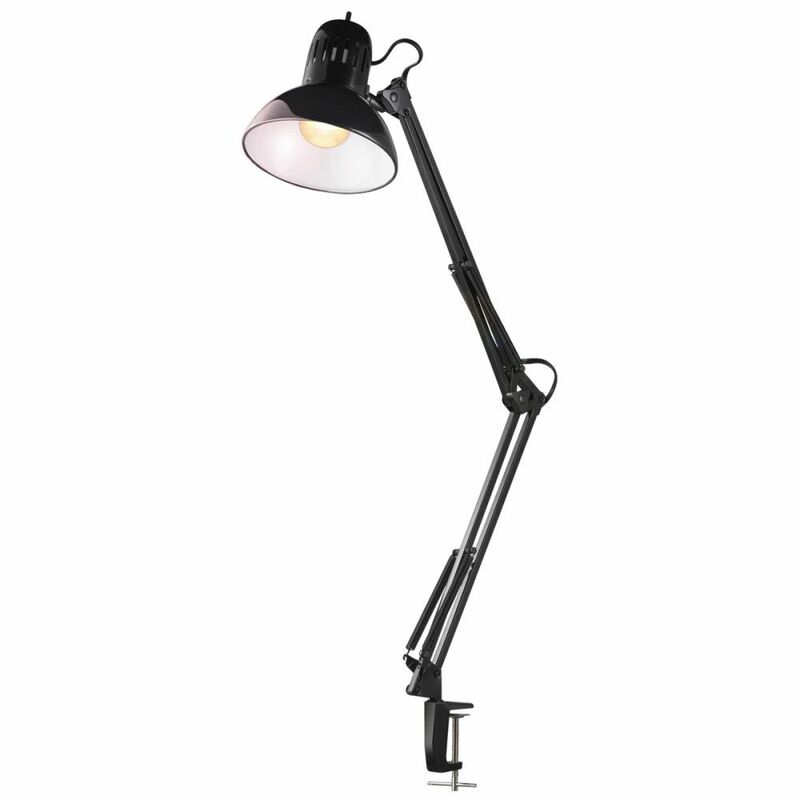 32-inch Multi-Joint Black Metal Clamp Desk Lamp is rated 4.4 out of 5 by 165. Rated 5 out of 5 by JG2019 from Yes It is a great product as of now.... Yes It is a great product as of now. Rated 5 out of 5 by Saani from Easy to assembled, affordable price ,good quality.... Easy to assembled, affordable price ,good quality. Rated 5 out of 5 by Oldmancamarillo from Good value for the money!... Good value for the money! Rated 5 out of 5 by Otty from Perfect Piano Light Bought this lamp to light up the music on my grand piano. Works perfectly. Rated 5 out of 5 by HomeDepotCustomer from Good quality for the money.... Good quality for the money.